An organization is only as strong as the team behind it. Margaret F. Foley serves as Senior Account Executive of Capstone Group, focusing on large commercial accounts. Bringing more than 30 years of insurance experience, Meg possesses a true client-centric approach by putting the agency’s clients first and serving their needs in an efficient and effective manner. Meg has worked at Capstone and its predecessor firm since 1984 and previously worked at the William Hyndman III Insurance Agency. She earned a Bachelor’s of Arts in Communications from the University of Delaware. Meg lives in Ambler, Pennsylvania with her husband; they are the proud parents to seven children and enjoy time with their two grandchildren. Bill Mooney serves as Account Executive for Capstone Group's commercial property and casualty insurance team. He works to create and manage insurance solutions for the agency's clients, using an educational approach that focuses on teaching companies how to mitigate risk with a comprehensive insurance program. Prior to Capstone, Bill worked at an independent insurance agency, working closely with financial institutions, professional services firms, and other commercial accounts. Bill earned a Bachelor's of Science in Education from Penn State University, as well as an MBA from Villanova University with a concentration in finance and real estate. He lives in Wayne, Pennsylvania with his wife and their young son. Morgan Eberly serves as an Account Manager on Capstone Group’s commercial property and casualty insurance team. Her primary responsibilities include serving new and current business clients to ensure optimal coverage and excellent customer service. 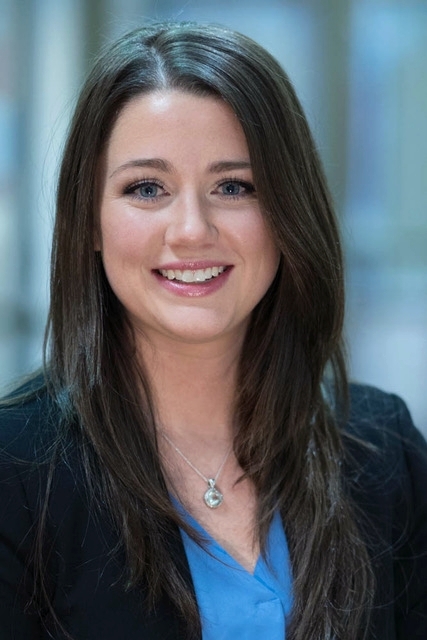 Morgan is a graduate of Temple University’s Risk Management and Insurance program, earning her Bachelors of Business Administration from the Fox School of Business. She enjoys traveling, football, and visiting her hometown of Lancaster, Pennsylvania. Lauren E. Hetherington serves as Account Manager for the firm’s commercial insurance team. She is responsible for overseeing the firm’s existing business clients and ensuring each new client is receiving the highest level of customer service. Lauren earned a Bachelor’s of Science from James Madison University and previously served as an office manager for a real estate company. She enjoys traveling, cruising and is a passionate Washington Capitals fan. Lisa serves as an Account Manager on Capstone Group’s commercial property and casualty insurance team. With over 20 years of experience in the insurance industry in KS, CA and PA, Lisa brings a wide range of agency and company knowledge from her past experience in underwriting, risk management, and customer service & sales. Lisa graduated from McPherson College with a Bachelor’s of Science in Agricultural Management and has also obtained the Associates in Insurance Services professional designation. She is passionate about finding solutions to everyday problems, building relationships, and helping others better understand how their insurance products can help meet their goals. In particular, Lisa enjoys researching creative avenues in emerging businesses & unusual exposures. She currently resides in Montgomeryville, PA with her husband and 4 boys. She also has two grown daughters and one grandson still residing in KS. Outside of the office she enjoys photography, painting, cards & board games, NCAA sports, and of course a new found love for all the Philadelphia teams. Gina Doyle serves as Senior Account Executive of Capstone Group, focusing on personal accounts. She brings more than 20 years of experience working in personal insurance to her daily operations, which include endorsements, renewal reviews, quoting and preparing proposals, resolving coverage issues, contract analysis and exposure analysis. In addition to timely and transparent communications, Gina works with clients to help them gain a greater understanding of their coverage, exclusions and exposures. Gina joined the insurance industry in 1992 and has managed personal lines and claims departments during that time. She earned a Certified Insurance Service Representative Designation and Certified Professional Insurance Agent Designation, and also has her Bachelors of Science in nursing. Gina lives in Montgomery County, Pennsylvania and is very active in the community, particularly among charitable organizations focused on providing assistance to military veterans and their families. Erin N. Saunders serves as Account Executive of Capstone Group, focusing on personal accounts. Her responsibilities include endorsements, renewal reviews, quoting and preparing proposals, resolving coverage issues, contract analysis and exposure analysis. Erin serves as a trusted partner and valuable resource to her clients. Prior to Capstone, Erin held a variety of roles within insurance, real estate and human resource management. She earned a Bachelor's of Science from Eastern Mennonite University. She lives in Souderton, Pennsylvania with her husband and son, and is active in her church and loves reading in her spare time. Brett Kraemer serves as Senior Benefits Consultant of The Capstone Group. He has worked in consultative sales in the mid-market space for 15 years within some of the largest HCM and Insurance Brokerage firms in the country. Prior to joining Capstone Group, he was Vice President of Employee Benefits for the Mid-Atlantic Region at USI Insurance Services. Prior to that, he was the Senior District Sales Manager for the Philadelphia Major Markets HCM sales team at Paychex Corp. He recruited, led, trained, and managed a team of 9 HCM Consultants exceeding 2 million dollars in sales goals. Kristen E. Blodgett serves as an Assistant Account Manager in Capstone Group’s Benefits Department. Her current responsibilities include assisting with preparation for new client pitches and delivering the highest standard of customer service to clients she interacts with. Prior to Capstone, Kristen worked in the medical billing field, working closely with patients, hospitals and health insurance agencies. She lives in Blue Bell, Pennsylvania and where she enjoys coaching youth field hockey, and actively volunteers for local organizations supporting those with developmental disabilities. Briana M. Scafidi serves as an Account Executive of Capstone Group, focusing on Employee Benefits. Her primary responsibilities are to manage existing benefits accounts and provide clients with the highest level of customer service by going above and beyond for each individual she serves. Briana earned a Bachelor’s of Science in Public Health and is Life and Health Licensed. She is passionate about sports and leading a healthy, active lifestyle. Briana is from Flourtown, Pennsylvania and is a die-hard Philadelphia Eagles and Flyers fan. Elizabeth A. Forsythe serves as an Assistant Account Manager in Capstone Group’s Benefits Department. Her current responsibilities include assisting in daily office operation to ensure efficient organization and communication both internally and externally. She enjoys learning about the insurance industry and how it varies across our Personal, Commercial, and Employee Benefits divisions. Elizabeth earned a Bachelor’s of Science from West Chester University. She currently resides in Philadelphia, Pennsylvania where she spends her time hanging out with her family, including her eight siblings. She loves spending summer weekends on the beach in Sea Isle City, New Jersey. Madeleine M. Farrell serves as Operations Manager of Capstone Group, and her primary responsibilities include managing and reporting the firm’s finances. Prior to Capstone, Madeleine held several financial management leadership roles beginning in 1989, including Chief Financial Officer for a privately held managed care organization. She earned a Bachelor’s of Science in Accounting and Finance and an MBA in Finance, both degrees from LaSalle University. Madeleine lives in Jamison, Pennsylvania.